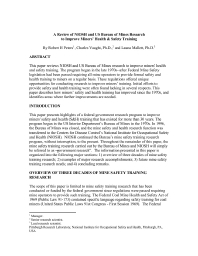 This paper reviews NIOSH and US Bureau of Mines research to improve miners' health and safety training. The program began in the late 1970s - after Federal Mine Safety legislation had been passed requiring all mine operators to provide formal safety and health training to miners on a regular basis. These regulations offered unique opportunities for conducting research to improve miners' training. Initial efforts to provide safety and health training were often found lacking in several respects. This paper describes how miners' safety and health training has improved since the 1970s, and identifies areas where further improvements are needed.